This penthouse is one of the pieces that crown the new Casa Burés, the modernist building of the early twentieth century completely renovated in the very center of the city. 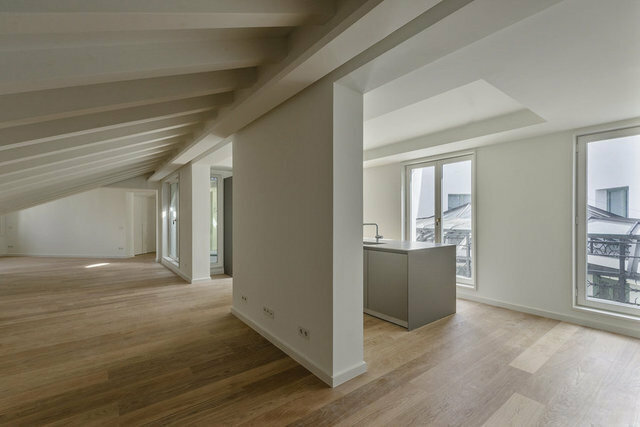 The space that was used as the porter’s house, the laundry rooms and the storage rooms, offers after its reconversion a minimalist and contemporary option. In a total area of 221 m2, the new architectural design maintains the most outstanding elements such as the sloping ceilings and balustrades and incorporates skylights that bring luminosity and originality to the space. The uniqueness of this property is its master bedroom structured on two levels and composed of anteroom, bedroom, dressing area and bathroom with tub. A very modern interior design, with white tones and soft lines inspired by nature, allows you to enjoy the sun, the views, and all the typical terraces of Barcelona's Eixample district.